Looking for tips and hacks to improve your food photography? With a few simple hacks, you can enhance the overall appearance of the images that you click instantly. Food photography is all about getting your job done right. The images that you click and post can tell a bigger picture of the journey traveled and experiences recollected during the shoot. Lighting is the Key: Perfect lighting is one of trickiest aspects to master the art of excellent food photography. The interiors of the restaurant or the café could be dull, super dark, candlelit, or even bright –depending on the location of your dining. Unlike other categories of photography, it is hard to know what to expect as far as it comes to ensuring proper lighting for perfect food photography. The best plan here to go ahead with supplementary lighting. Try packing a speedlight for your photography sessions. Maintain Focus: Remember that food photography is just like some product ad –the dish here is the main focus. While you can include some additional foreground as well as background elements to enhance the appearance of the image, it is important to note that the image should not look cluttered with glassware, dishware, napkins, and others. Try including only those items that aim at maintaining the focus on the dish. Angles Matter a Lot: The dish that you will be photographing would dictate your decision of taking photographs from certain angles to amplify the end results. For instance, are you considering taking shots of a perfectly pizza topped pie? Here, the best angles might be the overhead view of the main topping. However, if you are photographing some shots of a strawberry cake, then you can lower down the angle to take some excellent shots of the beautiful layers of the cake. Before thinking about any angle of photography, it is important to follow your instinct towards deciding upon the best angle as per your imagination. Keep the Herbs Fresh: If you wish to get the best out of food images with herbs on them, then always maintain the freshness of the herbs for some great shots. You can keep the herbs fresh at all times by storing them ice water. The fresh-looking herbs on your platter enhance the overall appearance of the food images and make them appealing. Make Fake Steam for the Photos: If the food has turned cold, then you can create fake steam to amplify the looks of the final image. Make use of some soaked cotton balls and microwave them to create the appearance of the fake steam –adding glamour to your food images. Use these hacks to create the best food photo shoots! Are they a money pit? To discuss. Now, I must point out that the viewpoint I will be looking at will be buying one second hand and in the UK, so figure will be ££££ and UK metrics etc. Obviously there will be so many variable when it comes to parts, where you take the car for maintenance, servicing, upgrades, insurance and so on. £1500 on routine maintenance per year. £700-800 on non-routine maintenance, more wear and tear, like brake pads and fluid. £1000-1300 on a full set of tyres as it does vary depending on the brand, just like any other car. On a side note, it isn’t THAT bad for tyres, compare the price to a M car from BMW. Insurance, as I mention, this will vary massively depending on age, location, driving history. Do some insurance quotes or even just fire your details into the likes of Go Compare or similar. My quotes varied from £600-2500+. As you can see there is a huge variance just with my quote, so I would always recommend punching in your own details before you go GTR hunting. It is a thirsty beast, there is no denying that. The car will manage around 20 to 25mpg on motorway runs, but don’t expect that all the time, you really are looking at low to mid-teens on most journeys. Here are a couple of popular GTR video in the UK about running cost. The cool Jack on EzekielN7 YouTube channel and this epic video by Louis on the Life on Unleaded YouTube channel. The videos were produced some years ago, but still relevant just now as the prices are very similar. Really can’t wait to buy a GTR or not sure you can handle one? Why not try before you buy. 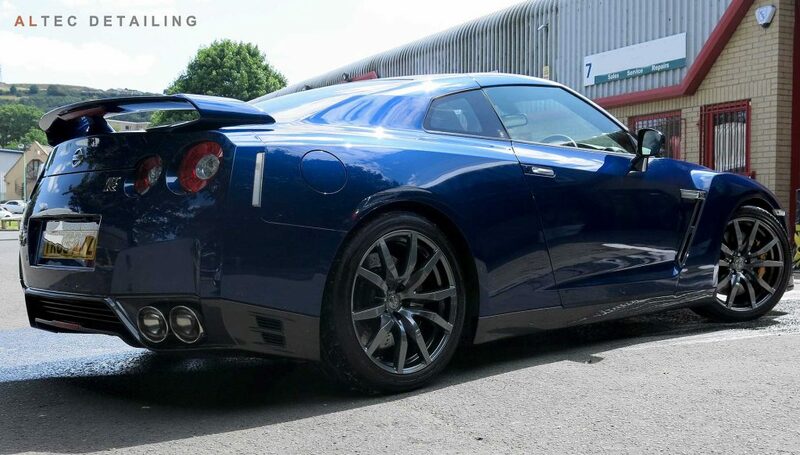 Car Seeker are a company that offer Nissan GTR hire for one day or longer. They even offer GTR experience days. Both are ideal presents, simply get in touch with the owner Mark at CarSeekers.co.uk and he will discuss everything with you. As mentioned, Litchfield’s is my personal recommendation. They specialise in all things GTR, from tuning to parts to servicing and sales. Their website can be found at litchfieldimports.co.uk. Next is Middlehurst who are also GTR enthusiast that offer servicing and sales. Check them out at Middlehurst.co.uk. Next up is Severn Valley Motorsport who know everything about Nissan GTRs when it comes to servicing and tuning. Website at severnvalleymotorsport.co.uk. Another favourite is JM Imports for pretty much all your GTR needs. Website at jm-imports.co.uk.